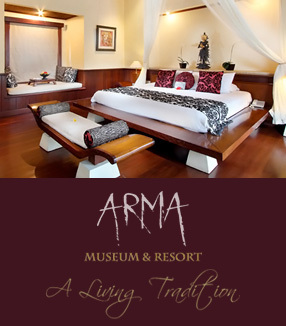 Venue : ARMA Museum, JalanPengosekanUbud Bali. Opening : January 25th 2014. Time : 18.30 hrs. pm. Born in Eindhoven The Netherlands 1941, Jan Peter van Opheusden attended the renowned Academy for Industrial Design in Eindhoven, The Netherlands. After a career as a teacher in drawing and sculpting he established as an independent painter in the early eighties of the last century. Soon his work was vastly collected by Dutch, German and French art collectors. His international breakthrough came with the exposition “Painter On The Roof” in 1998 at La GrandeArche in Paris France. At that time the European Union existed of 8 member states and Jan Peter van Opheusden was selected the Dutch artist to represent The Netherlands with an astonishing 145 paintings and 40 sculptures. Earlier in 1993 Earl McGrath Gallery in Los Angeles USA discovered and showed his work, selling it to celebrities like Tina Turner, Tony Curtis and Roger Moore.His name was internationally established and galleries and collectors sued for his hand. His work is highly emotional and at times pure poetry. What does the art community has to say about his work? “All this to come to the works of an artist I barely know, whose works I just discovered a few weeks ago, Jan Peter van Opheusden, and which have stunned me. But how can words convey the rhythm that inhabits them, as they combine and pulsate within one another, when not standing out in a sudden contrast and burst of red, blue and more. Do they shape forms or figures? Yes, they seem in an instant to do so in shadows, but, a while later, no! It becomes obvious the “subject” our eyes wants to see is not the final and only one. As soon as it is on the verge of fully standing out, it already flutters and “moves”, to be eventually turned into something fleeting, beyond any definition, or rather always “between” any fixed state of form and color. “Indefinable” and “fuliginous” are perhaps the best adjectives to qualify what one sees, as forms and colors successively grow, then wither and blend into one another, continuously morphing into forms and un-morphing into colors. Looking at a J.P’s painting is thus a purely sensorial experience about “something” visual one “feels” and does not have to comprehend to love. A few things can be explained though. It is obvious that J.P van Opheusden is on the side of the subjective. Reality may be what he has all around himself, but it does not interest him in itself. He does not want to describe it, and even less study and delineate it. Even if he knows the rules of academism, he looks indifferent to “representation” and it’s related problematic. Reality matters to him only as the locus of his emotions, and representation as the field of his intuitions. To him, the world is not out there to be understood, it has instead to be “his” world, fully encapsulated in the way he feels it —which is why he translates it in fluctuating colors and indefinable forms. So, contrary to “modern” artists, one cannot say of his art that it is based on a systematic exploration of form and even less color. It is too intuitive for that. His paintings may be musical, but certainly not in the intellectual way of someone like Kandinsky. They are more spontaneous or, let me use the word, more “naïve”. If music there is in them, it is more like the music of the flute-playing shepherd than that of the conductor. Yet J.P van Opheusden is not guided by any “psychologism” either, be it that of surrealism or Cobra. It is not the “exploration” of the self he is after. In his works, it is the “unconscious” rather than the subconscious that comes out. “Something” that flows out, just like that, effortless, at what he sees, experiences and feels. What he senses at the view of a woman, of a flower, of Bali. Intuition rules. Translated in color, and with an exceptional intensity. J.P van Opheusden is a well-known painter in Holland. Born in Eindhoven (1941) where he still lives today, he was trained not at a proper art school , but at the AcademievoorIndustrieleVormgeving (Design Academy) in Eindhoven, an environment which probably gave him more leeway to express himself outside the fashions of the day. He has exhibited throughout Europe and in the US. One also finds him in many publications, including in a book, Oogin Oog(Eye to Eye), where he stands next to the likes of Corneille and Picasso. We sincerely believe in intercultural exchange of “creative DNA” between East and West. Therefore we cordially invite you to be present at the press conference in order to interview the artist on his thoughts and views on this subject and of course on his work. During the opening ceremony we celebrate these two worlds coming together through the emotional and spiritual power of a great Balinese modern dancer. 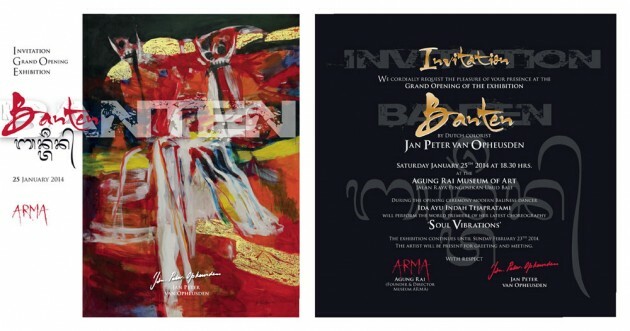 Ida Ayu Indah Tejapratami will perform the world premiere of her choreography : “Soul Vibrations” Where in the works of Jan Peter van Opheusden emotion is frozen in paint, the performance of Ida Ayu is emotion in motion in its purest form. A truly great way of two worlds embracing each other.